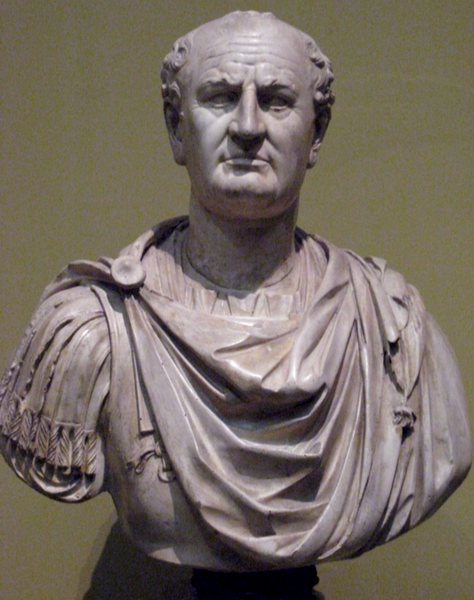 Vespasian was Roman emperor from AD 69 to AD 79. Vespasian was an accomplished general, and subjugated Judea during the Jewish rebellion of 66. While Vespasian was besieging Jerusalem, emperor Nero committed suicide and plunged Rome into a year of civil war. After Galba and Otho perished in quick succession, Vitellius became the third emperor in April 69. The Roman legions of Roman Egypt and Judaea reacted by declaring Vespasian, their commander, emperor on 1 July 69. Vitellius was defeated, and Vespasian was declared Emperor by the Senate. Little information survives about the government during Vespasian's ten-year rule. After his death he was succeeded by his eldest son Titus, thus becoming the first Roman Emperor to be directly succeeded by his own natural son. Reverse: COS VIII, Mars standing left, holding spear & trophy. Reverse: S-C, Mars walking right, carrying spear and trophy. Ref: RIC II 199; BMC 777; Paris 539.